Gorgeous Moroccan restaurant in Paris. Pretty cheap, super-tasty. I am very full. "You know, maybe aliens know all this, and we’re come-latelies to the whole comprehending-everything thing, but there isn’t really any more you can do in our current Universe than this. It’s the top thing. It is everything. This makes us amazing." James has basically said everything about our trip to CERN that is worth saying. This is all true. It was great and humbling. I'd also point out that every time you step out, you're under the Alps, and they're also phenomenal and humbling. Network connected thermal printer. Bookmarked for future reference. "Proteus, in the end, helps me move further into a design philosophy that avoids blacks and whites, finding a comfortable home in the much less solid greys. Videogames aren’t about mechanics. They aren’t about visual or audio either. They aren’t about the ideas of the author or about the experience of the player. They aren’t about story or actions or strategy. They aren’t about controllers or processors or screens. They aren’t about technology or culture or ritual. Videogames are a combination of all these factors, or a combination of some of these factors. Videogames are whatever we want them to be. For Ed Key and David Kanaga, while making Proteus, videogames are about the beauty of walking, looking, and listening." However much I bang on about rules/systems/you know the score, I still very much agree with this. I still like the abstract. Or rather, I made eight books. If you’ve read this site for any particular length of time, you’ll be aware that I produce a lot of links. Jokes about my hobby being “collecting the entire internet” have been made by friends. 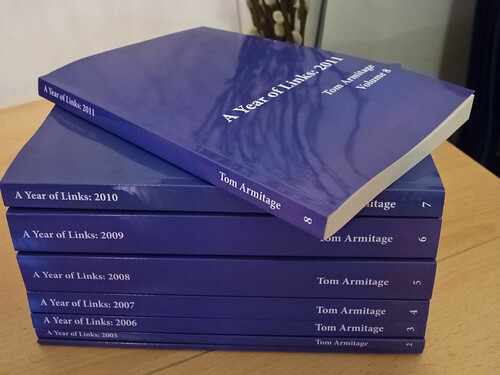 I thought it would be interesting to produce a kind of personal encylopedia: each volume cataloguing the links for a whole year. Given I first used Delicious in 2004, that makes for eight books to date. Each link is represented on the page with title, URL, full description, and tags. Yes, there’s also a QR code. Stop having a knee-jerk reaction right now and think carefully. Some of those URLs are quite long, and one day, Pinboard might not exist to click on them from. Do you want to type them in by hand? 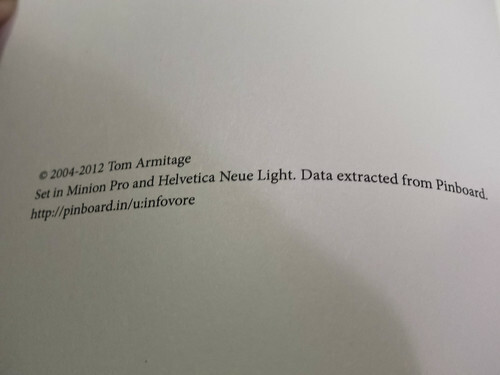 No, you don’t, so you may as well use a visual encoding that you can scan with a phone in the kind of environment you’d read this book: at home, in good lighting. It is not the same as trying to scan marketing nonsense on the tube. 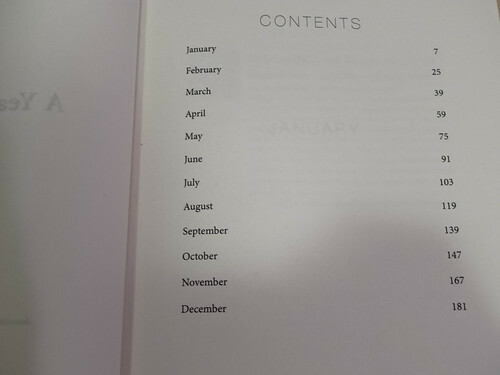 Each month acts as a “chapter” within the book, beginning with a chapter title page. 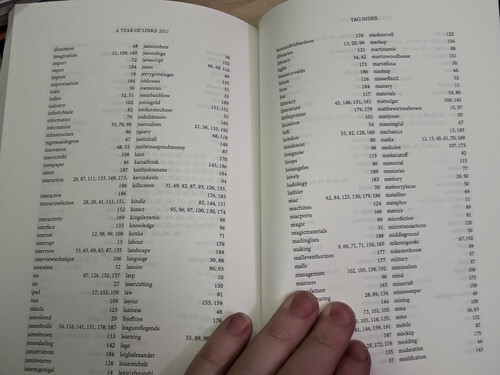 Each book also contains an index of all tags, so you can immediately see what I was into in a year, and jump to various usage. Wait. I lied. I didn’t make eight books. I made n books. Or rather: I wrote a piece of software to ingest an XML file of all my Pinboard links (easily available from the Pinboard API by anyone – you just need to know your username and password). That software then generates a web page for each book, which is passed into the incredible PrinceXML to create a book. Prince handles all the indexing, page numbering, contents-creation, and header-creation. It’s a remarkable piece of software, given the quality of its output – with nothing more than some extended CSS, you end up with control over page-breaks, widows and orphans, and much more. The software is a small Sinatra application to generate the front-end, and a series of rake tasks to call Prince with the appropriate arguments. It’s on Github right now. If you can pull from Github, install Prince, and are comfortable in the terminal, you might find it very usable. If you don’t, it’s unlikely to become any more user-friendly; it’s a personal project for personal needs, and whilst Prince is free for personal use, it’s $4800 to install on a server. You see my issue. So there you are. I made a machine to generate books out of my Pinboard links. Personal archiving feels like an important topic right now – see the Personal Digital Archiving conference, Aaron and Maciej’s contributions to it, not to mention tools like Singly. 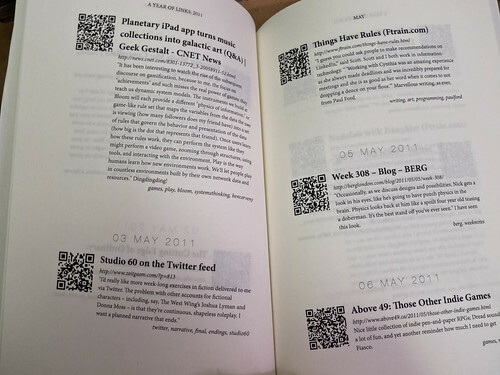 Books are another way to preserve digital objects. These books contain the reference to another point in the network (but not that point itself) – but they capture something far more important, and more personal. They capture a changing style of writing. They capture changing interests – you can almost catalogue projects by what I was linking to when. They capture time – you can see the gaps when I went on holiday, or was busy delivering work. They remind me of the memories I have around those links – what was going on in my life at those points. As a result, they’re surprisingly readable for me. I sat reading 2010 – volume 7, and my proof copy – on the bus, and it was as fascinating as it was nostalgic. So there you have it. I made a book, or rather eight books, or rather a bottomless book-making machine. The code is available for you to do so as well. It was hugely satisfying to open the box from Lulu at work one morning, and see this stack of paper, that was something I had made. "I would call him the greatest puzzle designer of all time, but that implies that there are lots of people who do what he does and he’s better than them, and that’s not quite right. What I mean is to say is that Raymond Smullyan is the Marcel Duchamp of puzzles, he’s the Brian Eno of puzzles. His work is singular, transformative, genre-defining, in a class by itself." "Kareem, after the game, remarked that he would pay to see Doctor J make that play against someone else. Kareem's remark clouds the issue, however, because the play was as much his as it was Erving's, since it was Kareem's perfect defense that made Erving's instantaneous, pluperfect response to it both necessary and possible—thus the joy, because everyone behaved perfectly, eloquently, with mutual respect, and something magic happened—thus the joy, at the triumph of civil society in an act that was clearly the product of talent and will accommodating itself to liberating rules." This is phenomenal writing. "There’s no demonstration of life’s futility or language’s emptiness that is so profound, it can’t one day be turned into a reassuring fridge magnet, and that thankfully helps put pessimism back in its place." "Unless you design, build, experiment and test in the real world in a tight loop, you can spend a lot of time on the wrong problems" Yep. "Seventy fifth birthday looming up and a small self fest to celebrate." All excellent news. Also: 40 years of "20 sites n years"; wonderful. The 21st century is one in which society increasingly moves away from an infrastructure of direct action, to one of layered systems. Those systems are built out of many materials: hardware; software; urban infrastructure; politics; morals; people. These interconnected structures often seem strange and foreign. But we’ve played with interconnected systems for thousands of years. Games are what Eric Zimmerman has called “systemic media”; they are one of the many native cultural forms to this systemic age. This talk examines the ways systems exist in games, and their value in understanding a systemic world. What are the ways games teach us about the interconnectedness of things: how to understand it, and how to live within it? I think the final talk will probably be similar. Anyhow: if you’re at Lift this week, do say hello! And if you’re not, I believe the talks will be streamed live over at the lift website. "Every time you throw in a quick fix for something because it’s Getting Late(tm), stop and see if you can fix it correctly right then. Pragmatism says it might not be possible in the time remaining, and that’s ok; “Real artists ship” and all that but a ruthless artist will fix the problem first thing in the next release so they can keep shipping again and again and again." Unhuh.